The Parliamentary Registry officially received nominations from candidates for the upcoming by-election to be held on Thursday, June 7th, with a total of four candidates for the two by-elections with the PLP and OBA set to contest both seats. As the by-election draws closer, Ms Woolridge is reminding the public that an Advanced Poll for travellers and incapacitated voters will take place on 31 May 2018 in the respective constituencies. More information about the Advanced poll can be found on the Parliamentary Registry’s website. 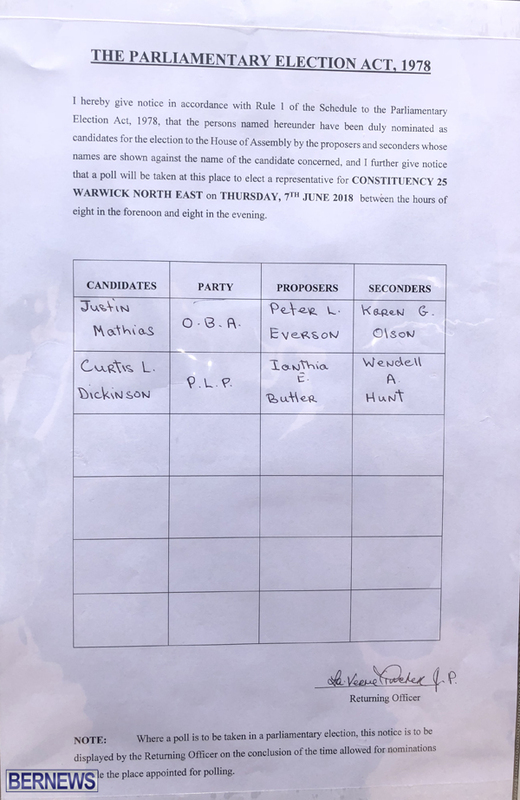 The by-elections on June 7th will see voters set to head to the polls as a result of the resignations of former OBA MP Dr Grant Gibbons in Paget East, and former OBA MP Jeff Baron in Warwick North East. 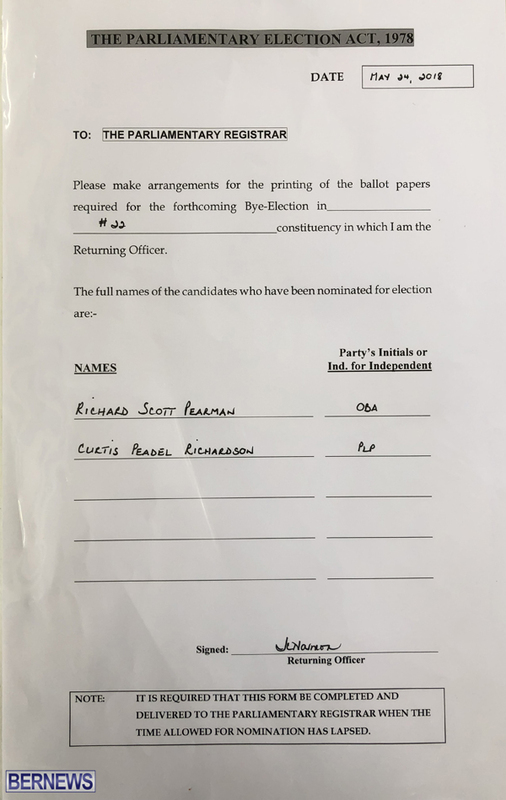 I’m delighted to see Mr. R. Scott Pearman following in his grandfather’s footsteps – Sir. James Pearman, one of the original three CDP partners and MCP – and getting involved. Indeed, it is with much fondness that so many of us older Bermudians remember how well Sir. James oversaw the island’s security apparatus, especially the Police department, back in the early 1960s. Undoubtedly retiring MP Dr. The Hon Grant Gibbons is delighted to see his safe seat safely transferred to such a safe set of hands. Curtis Richardson has run a good campaign and I have seen his team on the streets of Paget quite often. Hopefully the residents give credit to him for actually canvassing. Curtis Dickinson will be a great addition to the PLP Parliamentary team. I am pretty confident he will defeat Mathias in Warwick although it should be a close one. We all know Paget is a Red Parish, all the best.